The above chart includes physicians who participating in "Enduring" online CME activities, which ACCME defines as: an Internet that is "available when the physician participant chooses to complete it. It is 'enduring,' meaning that there is not just one time on one day to participate in it. Rather, the participant determines when he/she participates. 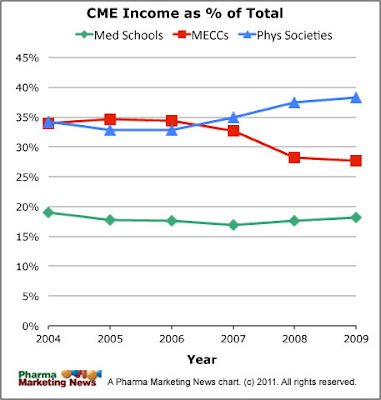 (Examples: online interactive educational module, recorded presentation, podcast)"
The chart does NOT include physicians who participate in "Live" Internet CME; ie, "an online course available at a certain time on a certain date and is only available in real-time, just as if it were a course held in an auditorium. Once the event has taken place, learners may no longer participate in that activity. 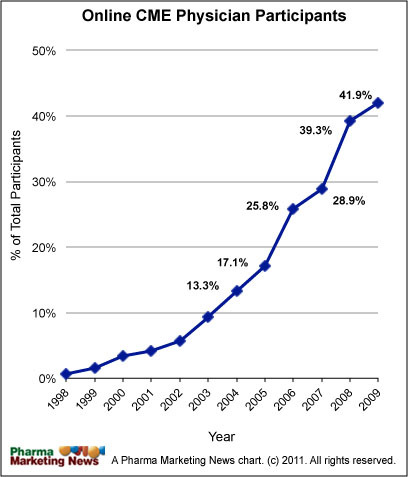 (Example: webcast)"
In 2009, only about 38,000 physicians participated in live Internet CME courses compared to 4.5 million physicians participating in enduring online CME. NOTE: These numbers refer to the number of registered attendees of CME events. Some physicians may attend more than one course and thereby be counted more than once. A third type of Online CME defined by ACCME is "Internet Searching and Learning," in which about 116,000 physicians participated in 2009. This is a CME activity "in which a learner accesses the content of the activity directly from the internet. This is differentiated from a 'course' and an 'enduring material' because the provider does not create the content but rather the learner chooses content based on what (s)he feels meets their needs or answers their questions." Wow! 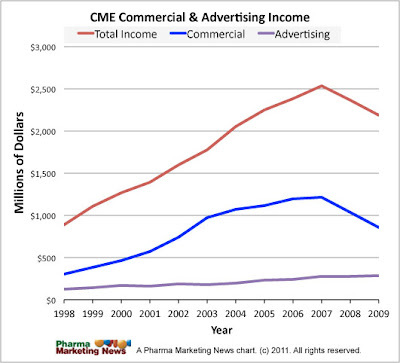 Physicians can get CME credits just by searching for medical information on the Internet. No wonder Wikipedia has become an important source of information for physicians! For-profit MECCs were responsible for 99.5% of physicians (115,324) who received "Internet Searching and Learning" CME credits. I suppose MECCs draw up a list of multiple-choice questions that physicians must answer after searching the Internet. Perhaps they are directed to search certain sites such as WebMD or Wikipedia. It's likely that nobody reviews this information to determine if it is "unbiased." 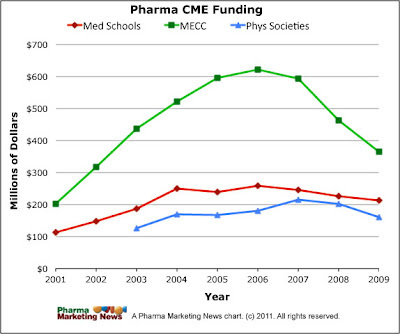 It's possible, therefore, for pharma companies to publish non-peer-reviewed content on these sites and thereby "game" the process and not be held responsible for sponsoring "biased" CME content. P.S. 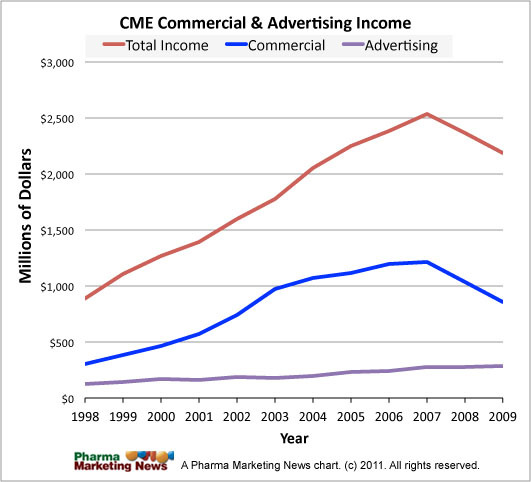 The 2010 ACCME annual report will be available sometime this July at which time I will update these charts. What events or factors do you conjecture may have caused the precipitous and sharp decline? Good afternoon. Did you already post the updated charts? Thanks for reminding me! 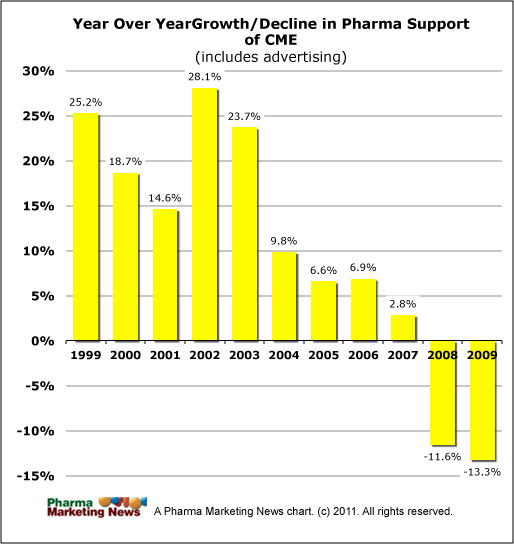 I will do that in an upcoming post to Pharma Marketing Blog.